Closeups can be seen here: http://www.thefifthorder.net/misc/random/Chronos_Final_Closeups.jpg Chronos - The father of time and the guardian of the end of time (as depicted here). Chronos himself is a being composed of both organic and mechanical matter. In the core on his chest, holds the world as we know it - galaxies upon galaxies. 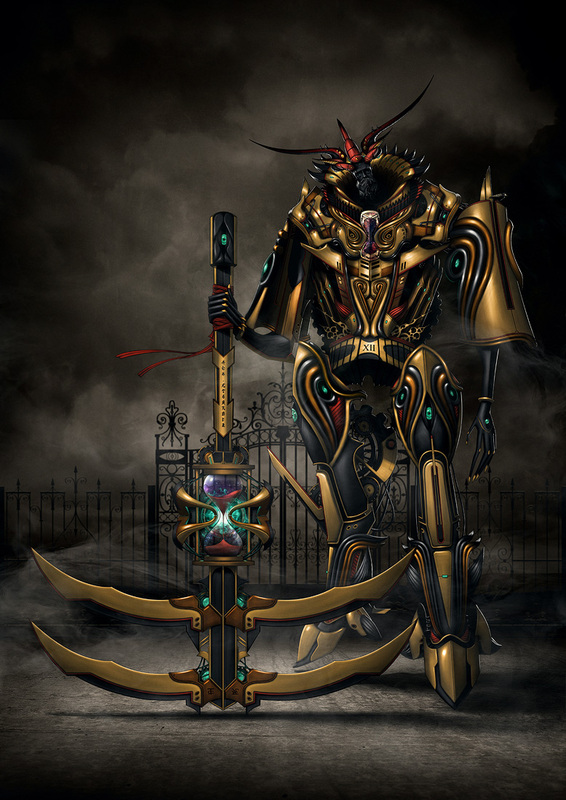 He wields a scythe where the sands of time are located, and if you can see the 2 different asian characters on each side of the scythe's head - 1 means life, 1 means death. It is he who controls life and death as we know it. This is Chronos.